Based in New York City, Organic Avenue was founded on the belief that “you are what you eat, beauty comes from the inside out and healing happens naturally via a fresh, whole food, plant-based diet”. Founder Denise Mari started the company out of her Lower East Side loft. Together with CEO Doug Evans, Organic Avenue has grown into a vegan lifestyle business complete with raw food classes and a prepared food and nutritional supplement line. Organic Avenue offers three levels of cleansing: LOVE Easy, a "beginning cleanse, perfect for first timers, incorporates raw food & juice", LOVE Fast, "a juice-based cleanse that includes a salad at the end of the day", and LOVE Deep, an all-juice, "3-day deep dive into pure liquid nourishment". LOVE Deep, their most popular cleanse, is available nationwide via FedEx. Those living in the New York City area can pick up any of the cleanses at one of their retail locations or have them delivered. I like that the two locally-available cleanses include raw food because an all-liquid cleanse is often too restrictive for beginners. The fruits and vegetables are organic and are juiced daily using a hydraulic juice press in a 3,000 sq. foot refrigerated commercial kitchen space in Long Island City. The juices are unpasteurized and produced in a cold space in order to retain the nutritional profile and potency of the juices, which keep for up to 72 hours. If you are in the New York area, the juices are available in 16-ounce glass bottles. If you are ordering via FedEx, the juices are packaged in 14-ounce plastic bottles made of biodegradable polylactic acid (a corn derivative). One distinct feature of the Organic Avenue cleanse was the wide variety of juices, which is great for the adventurous and those with broader palates but might not be ideal for those who don’t want to think about what the next drink will taste like. Because of the variety of juices, I had to refer to the above cleanse menu, which was delivered in three separate emails (one for each day), to know what to drink next. It wasn’t a hassle, just not as convenient as the more common practice of having sequentially numbered bottles. There were several standouts, such as the seasonal red juice and the green coco juice. Some of the juices were strong-tasting and it was difficult to finish the whole 14-ounce bottle. Nut milks are typically offered on juice cleanses at the end of the day and are a nice treat for making it through the day, however, I felt Organic Avenue's almond milk could have been thicker and slightly sweeter. The cashew hemp mylk had a slight hint of grassiness from the hemp but was rich and satisfying. I liked that most of the vegetable juices weren’t sweet. Five days prior to starting the cleanse, I received an email from an unnamed "resident holistic nutrition consultant" at Organic Avenue, who promised to send me information throughout the week to support me on my cleansing experience. He/she said that I should feel free to get in touch with any questions and concerns. The email also had information and guidelines on how to prepare, what to eat the night before, and how to prepare emotionally ("Write a list of intentions of what you would like to release from your life."). I got a second email the same day that explained that dry skin brushing, Epsom salt baths, colon hydrotherapy, light exercise, and massage could aid in flushing toxins from the system. Two days prior to the cleanse, I received three emails, each listing the order of juices for one of the cleanse days preceded by a quote and positive affirmations for that day. The emails have a local New York phone number to call if you need guidance or customer assistance. There are also Facebook and Twitter pages. I liked that Organic Avenue digs deeper into the juice cleanse experience than other cleanses. Although there will always be people who use juice cleansing as a way of losing weight, judging by the support materials, Organic Avenue seems truest to the roots of juice cleansing as a way of purifying the body, improving health, and releasing stuck emotions. The three-day LOVE Deep is $210. FedEx overnight shipping is extra (for example, $87.95 to Boston). The refund policy: A full refund can be issued up to 4 days prior to the start of a cleanse, 50% up to 2 days prior. No refunds thereafter. Open or sealed juices and foods cannot be exchanged once they have left Organic Avenue’s premises. The online ordering process and emails could have been more clear and organized. For example, in In certain places on the website, it's mentioned that substitutions are permitted if someone does not like certain ingredients/juices, however, the online order form only asks about allergies. Also, I received an email congratulating me on completing my cleanse before I had received my juice shipment. 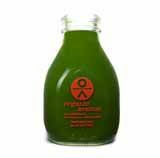 Those living in the New York City area can pick up the cleanses at their retail locations or have it delivered. The LOVE Deep Cleanse can be shipped nationwide via FedEx. As with all juice cleanses that are shipped nationwide via FedEx overnight, the delivery can only arrive Tuesday through Friday. Delivery is not guaranteed by 10:30 am and can arrive later, depending on your location. If you live in the NYC area, each day of the cleanse is picked up or delivered separately. If you receive the cleanse via FedEx, the three days are sent together. I received all of the juices in one 24 pound insulated cardboard box which had two ice packs. Organic Avenue ships their single juices, nut milks, smoothies, supplements, and packaged foods. They also offer LOVE Beauty, a 1-day LOVE*deep Cleanse paired with Tata Harper skin products. Organic Avenue is one of the more authentically holistic juice cleanses. While I haven’t visited their retail locations yet, the online cleanse is probably best for the adventurous or the more seasoned, due to the wide variety of juices and sometimes uncompromising tastes. I liked that many of the vegetable juices weren't sweetened, but felt that the almond milk should have been more satisfying. The support emails could be better organized but provide plenty of tips and affirmations for those wanting to delve into the cleansing experience.